“EMAHO! May the collective, compassionate blessings of the Victors of the ten directions, the yidams, and the khandro come for the welfare of sentient beings in this world! 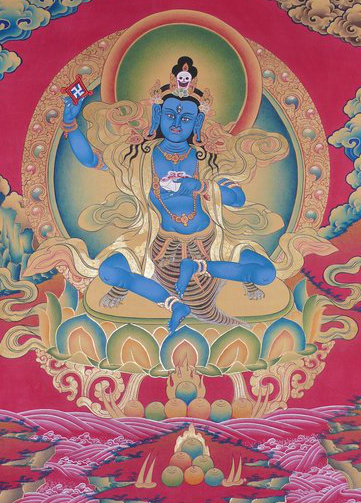 I pray for the uninterrupted blessings from the subduer of demons, Drenpa Namkha! Now, during this negative time, there is lots of fighting and violence, and many sentient beings die because of weapons. You are surrounded by the fierce, enlightened male and female deities. I pray to the Great Lama and his two sons, to the subduer of demons, Drenpa Namkha, stop the fighting and violence! Now, during this negative time, virtuous activities aren’t accomplished and there are many obstacles to the practice of virtue and morality. You are surrounded by the root lama and his retinue. I pray to the Great Lama and his two sons, to the subduer of demons, Drenpa Namkha, bring the practice of virtue to its fulfillment! Look upon me with your unbiased compassion morning and night, during the past, present and future. Turn back both seen and unseen enemies! Posted on July 9, 2017, in Prayer and Ritual, Tibetan Lamas. Bookmark the permalink. Leave a comment.